As you probably know by now, Don Garber held an impromptu press conference today. During it, he offered an impassioned rebuttal to what he saw as a slight from Jurgen Klinsmann towards Major League Soccer. There are almost certainly behind-the-scenes reasons for Garber to pick up the microphone, but to an outsider it reflects insecurity and pettiness. Garber doesn’t come off looking great in this fight. But Klinsmann has been picking a lot of fights lately. Klinsmann has set himself up as an anti-US-establishment figure, and the “Klinsmann vs. the system” narrative has been a constant since he began. He arrived on the job as USMNT head coach with promises of overhaul and change, most notably the youth system. Most people recognize that there are flaws in the American soccer structure, and so we embraced Klinsmann as a harbinger of change. After some early stumbles, the USMNT saw success under Klinsmann in last year’s World Cup qualifying. On the field success is the best way for a manager to endear himself to a fanbase. With the security of a long-term contract given to him following the World Cup draw, Klinsmann has broadened his targets. First: Donovan. This duel had personal aspects, but it was also symbolic. To really grab the attention of American soccer and the media, Klinsmann slaughtered its most sacred cow. Where fans and proponents of US Soccer viewed Donovan as embodying its best aspects and potential, Klinsmann saw the negative aspects and unfulfilled potential. Donovan stayed in MLS rather than go to Europe, and the media often praised him for accomplishments that are small on an international stage. And here is where Klinsmann, if he didn’t have them before, spawned enemies. Lots of them, particularly from American media outlets that are unaccustomed to soccer and only view Klinsmann as a foreign interloper telling us how to do our jobs. Xenophobic sportswriters aside, even parts of the soccer media were skeptical of the decision. Some Klinsmann supporters noted that the decision got the American mainstream talking about the make up of a World Cup squad weeks before the tournament, which was a first. After a fairly successful World Cup run (though that assessment is not shared by everyone), the furor surrounding American soccer largely died off. There were critics who noted that Michael Bradley wasn’t in his best position, that Klinsmann had no replacement for Jozy Altidore, and that Donovan could have offered more than Brad Davis or Mix Diskerud or Timmy Chandley. But largely there was peace, and American soccer’s supporters were just thrilled with the attention given to the World Cup. The peace was shattered about a week ago. Donovan’s farewell match was always going to be a testy moment, but he and Klinsmann each added fuel to the fire in the build up. Donovan seemed to confirm suspicions that the rift was more personal than tactical, and Klinsmann said that Donovan could have done more in his career, a statement both vague and all-meaning depending on how you wanted to read it. Klinsmann also selected an NASL player for the friendly squad and poked the sleeping bear of promotion and relegation. ESPN dedicated a halftime discussion to pro/rel, and nothing new was said because nothing new is ever said in pro/rel debates. Effectively, this is is all the same battle. Pro/rel vs. closed shop, Europe vs. MLS, Klinsmann vs. Donovan, Klinsmann vs. Garber. These are all different names for arguments that, if they aren’t exactly the same, have an awful lot in common. They are about soccer, but they are also about insecurity and authenticity and identity and setting the course for the still nebulous American soccer culture. These arguments are old, divisive, and tiresome, and neither press conference nor blog post will bring us any closer to resolving them. Since taking charge of the USMNT in 2011, Jurgen Klinsmann’s mouth has garnered more attention than his managerial ability. I happen to think he’s a fairly good manager, even if his best talent is attracting talented dual-nationals. But intentionally and otherwise he has served as a wedge in the American soccer community. There are some who’ll say that we needed to have the discussions Klinsmann has sparked. That may be true, but I think we can have them without the vitriol and politicization that they currently accompany. Everyone involved here wants what’s best for American soccer. There are disagreements on what is best for American soccer. But we can all agree that the petty arguments and drama of the past week are not it. Landon Donovan is expected to play about half an hour in his final game for the USMNT, in front of more than 30,000 fans at Rentschler Field in Connecticut. Donovan aside, the U.S. squad features relatively few MLS players, and a bevy of young talent. The surprise inclusion of Miguel Ibarra, from the NASL’s Minnesota United, may give him his first serious national exposure. Their opponents aren’t to be overlooked; Ecuador qualified for this summer’s World Cup, though they finished third in their group. The Cascadia Cup is on the line tonight in Seattle, with more than 54,000 tickets already sold. Seattle needs just a draw to claim the silverware, but will be looking for all three points in their quest for the Supporters’ Shield. The Sounders are 11-0-3 all-time when more than 40,000 fans attend, but they’ll be without right back DeAndre Yedlin, who was called into the USMNT. Vancouver needs a win both to retain the Cascadia Cup and to leapfrog Portland for the final playoff spot in the West. If you accidentally wake up early expecting to find the Premier League, you won’t be totally out of luck. Argentina and Brazil are playing a friendly in China. If you don’t mind watching on your computer, this should be a good game. The Red Bulls haven’t lost at home since May, but TFC’s loss at home to Houston on Wednesday leaves the Reds in a position where they all but need three points from this game. If things work out for New York elsewhere, they could clinch a playoff spot with a win. The Galaxy will have Landon Donovan available to them, but not Omar Gonzalez, as they seek to keep pace with Seattle in the Supporters’ Shield race. The New England Revolution have played all of one game on national television this year: a 1-1 draw against Chicago back in April. Compare that to say, the Red Bulls, who are currently in the midst of seven straight games being played on either ESPN or NBCSN. There are a couple reasons for this, but the end result is that the average fan isn’t very familiar with the team that currently sits third in the east. The recent signing of Jermaine Jones is by far the most recognizable name on the Revs, but there’s a lot of talent in Foxboro. 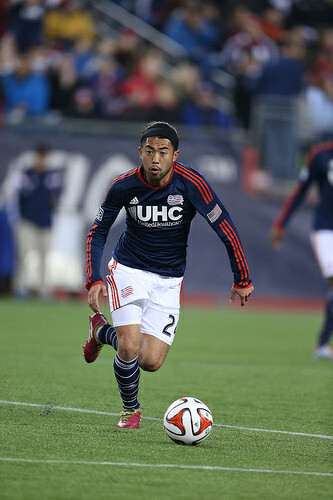 Perhaps the most important player for New England is Lee Nguyen. Born in Texas, Nguyen went to Indiana University for a season (like San Jose youngster Tommy Thompson), but began his professional career in the Netherlands. Unable to get much playing time for PSV, he moved to Denmark and then Vietnam before popping up in MLS with the Revolution in 2012. After a pair of solid seasons, Nguyen has emerged as a scoring threat this year with 12 goals, the most of any midfielder in the league. It’s time for us—and maybe Jurgen Klinsmann—to take a look at Foxboro and Lee Nguyen. At age 20, Lionel Messi scored 16 goals in 40 appearances for Barcelona. Wayne Rooney played 48 games and scored 19 times for Manchester United. At the same age, Clint Dempsey played college soccer. He played 19 games with unlimited substitutions and a countdown clock. Of the 23 members of the United States World Cup squad, 16 were developed in the U.S., and 11 of those played college soccer. I am willing to bet that they were the only 11 players in the entire tournament with college experience. I want to watch something as soon as possible. Like, tonight, if possible. What can you say about a game like that? You could say that Germany beat Brazil 7-1, but can numbers possibly tell the story? Brazil capitulated, at the sport they love, on the world’s stage, in front of their own fans. To describe it as shocking would be a criminal understatement. I was reminded of the devastation felt when Liverpool gave up a 3-0 lead at Crystal Palace. But yesterday was on a wholly different magnitude. There is no adequate comparison. What makes a man become a manager? We all aspire to play the game, but who dreams of becoming a manager? When you play, you have teammates and friends; when you are manager, you have nothing but enemies. The fans are demanding, the media hounds your every decision, and patient owners are a thing of the past. The failures of others will land on your neck. Why would you seek out the profession of manager?